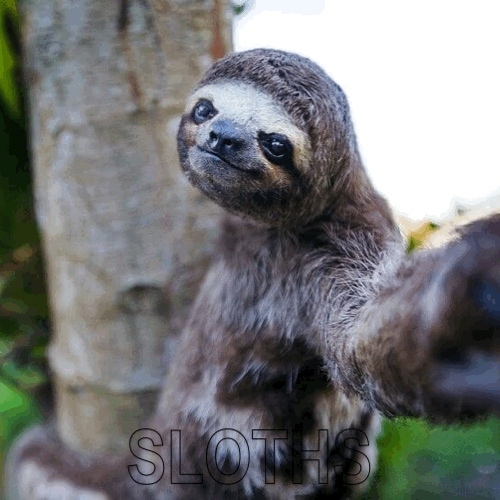 Sloths are medium sized mammals that are only found in the wild in south and central America. There are a total of 6 species of sloth, with 4 of 6 species considered endangered. Sloths get their name because they are slow moving and seemingly lazy... at first glance. To the untrained eye, it might look like sloths are just relaxing all day. The truth, however, is that these animals have adapted to primarily live off of a diet of leaves and branches. And, of course, leaves and branches do not contain much energy. Sloths look so lazy simply because they are always saving their limited energy! In other words, they must be very smart about their time management *hehe*. Sloths have also become more and more popular over the last few years, with many videos and "memes" popping up all over the internet.